Sustained war is a breeding ground for mental health disorders and substance abuse. Is the military changing its approach to the problem? 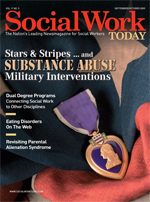 As military forces involved with Operation Iraqi Freedom and Operation Enduring Freedom in Afghanistan near a planned “draw down” phase, social work’s task of assisting servicepersons in their quest to recover, rebuild, and reintegrate into American society becomes more prominent. In coming months, don’t be surprised if your newest client is a Marine staff sergeant who sustained a traumatic brain injury (TBI) from a sniper’s bullet in eastern Afghanistan, an Army captain struggling with chronic pain after a rocket blasted her Apache helicopter from the sky over Mosul, or an Air Force officer beset with depression after viewing graphic images of a Pakistani village accidentally destroyed by a missile remote fired from his control center. For servicepersons and social workers alike, the challenges ahead are formidable. Military personnel accustomed to shouldering hardship in military theaters may soon present with a bewildering constellation of issues in the civilian world—some apparent and some artfully or unconsciously concealed. Clinicians aware of the general difficulty of treating substance abuse will find the challenge ten-fold when layered with TBI, posttraumatic stress disorder (PTSD), chronic pain, depression, or a combination thereof. How prevalent is the abuse of alcohol, prescription medications, and illicit drugs in the military? In 2007, the Substance Abuse and Mental Health Services Administration (SAMHSA) reported that 7.1% of veterans met the criteria for substance use disorder. Numbers for active duty personnel are lower, “but the military is a random sample of American society. The problems you see in our communities, you’ll also see on base,” says Jose E. Coll, PhD, a Marine Corps veteran and the chair of the military social work and veteran services program at USC. The culture of binge drinking that’s so ubiquitous on college campuses is also the bane of military commanders, says Michael E. Kilpatrick, MD, communications director of the Office of the Assistant Secretary of Defense for Health Affairs. In addition, warriors pushed to their limits will find a vast black market for prescription and illicit drugs. Notably, Afghanistan is the world’s largest producer of heroin. Push someone hard enough and long enough in an anarchic world of snipers, roadside bombers, and urban guerrillas, and it takes its toll. Suicide, Reyes notes, remains alarmingly high, and 33% of U.S. troops diagnosed with mental health disorders have three or more distinct conditions, according to the American Journal of Public Health. The Pentagon estimates that at least 45,000 to 90,000 Iraq and Afghanistan war veterans have, to date, sustained brain injuries severe enough to need specialized care for persistent symptoms. In 2007 alone, the diagnosis of PTSD jumped 50%. The need for effective outreach is reflected in a 2003 study in The New England Journal of Medicine, which found that fewer than one half of soldiers returning from Iraq with PTSD sought professional help, typically because of a fear of wrecking their careers. Female noncombatants have additional concerns. In 2006, nine in 10 female Marines reported “unwanted sexual contact” from fellow American servicemembers. In addition, the VA determined that 15% of female veterans had been victims of “military sexual trauma,” a new term for a centuries-old blight. Connecting the dots, Kilpatrick points to National Institute on Drug Abuse (NIDA) research that shows a link between PTSD, TBI, and drug abuse. “We cannot deal with these issues in isolation,” he says. Older social workers will remember the fate of U.S. servicepersons after the Vietnam War ended and Capitol Hill budget hawks slashed veteran funding. Over the next two decades, tens of thousands of hurting vets languished. Today, the Department of Defense (DoD) pledges top-notch support of its wounded warriors, but gaps persist. In January, Sen Claire McCaskill (D-MO) slammed the Army’s Substance Abuse Program at Fort Leonard Wood in Missouri as a shambles, faulting it for chronic understaffing and an institutional bias toward punishing, not treating, people in need. A USA Today story added to the growing perception of the DoD adrift when it reported of an Army with “no treatment facility for substance abuse and only 150 beds for inpatient care at a time when the number of soldiers seeking help has increased by 25% in the last five years.” Pentagon officials pledged to try harder, but in May, Stars and Stripes again blew the whistle. “Hundreds of soldiers” with substance abuse issues at six Army installations were deprived of counseling treatment by commanders who felt “pressured to keep their numbers up for combat deployments,” the military newspaper wrote. The good news is that the military appears to be making headway in the recognition, treatment, and prevention of substance abuse. The DoD is channeling billions of dollars into flagship programs that partner with the NIDA, the SAMHSA, the Defense Centers of Excellence for Psychological Health and Traumatic Brain Injury, and the National Center for PTSD, among others. Reform, however, is institutionally complicated by what Kilpatrick calls “a top-down driven structure focused on readiness and intolerant of the use of illegal drugs or the abuse of alcohol or cigarettes.” This is exemplified by the military’s practice of commander notification. Generally speaking, Coll says, the soldier who self-refers “fares better than if his condition deteriorates to the point that he gets into trouble.” In many instances, commanders are not notified if intervention is purely educational. Kilpatrick says some commanders will overlook a failed drug test and still deploy the serviceperson. But if treatment for dependency is needed, “command involvement” is almost a given. To a large extent, there remains an institutional leniency if the abuse involves alcohol. When a controlled substance (e.g., cocaine, heroin, methamphetamines) is abused, the individual is subject to being discharged from the military. In mid-April, Army Secretary Pete Geren shocked military traditionalists by floating the idea of allowing soldiers to volunteer for treatment without commander knowledge or fear of retribution. In 2008, more than 10,200 Army personnel received counseling for alcohol and/or drug abuse, but thousands more are believed too fearful to step forward. Most observers agree the DoD is moving in the right direction. Its stepped-up emphasis on prevention and early detection, beginning in basic training and continuing throughout retirement, is winning applause. Today, every serviceperson returning from combat theater receives a comprehensive health assessment within 30 days, which helps with biopsychosocial assessments. Similarly, Coll commends both the military’s Real Warriors campaign for reducing the stigma of seeking mental health counseling, as well as its resiliency initiative, which helps warriors develop the inner strength needed to surmount personal challenges. Much of the DoD’s outreach is cutting edge, including the use of social media to reach Internet surfers. Another major emphasis is interpersonal communication. Today, if a soldier or other serviceperson is misusing alcohol or abusing drugs, his “battle buddy” is encouraged to direct him or her to a substance abuse program. The military has accelerated its hiring of social workers, psychologists, and substance abuse counselors but is hobbled by its own tough, new credentialing standards that effectively disqualify a huge pool of talent in the greater treatment community. Reyes proposes a case-by-case evaluation of not-yet-licensed clinicians, including being receptive to the idea of employing new MSW graduates. “Why not provide them an outstanding counseling opportunity and also give them the clinical supervision they need?” he suggests. As the military looks to the future, it hopes to offer interactive, individual counseling sessions to servicemembers in small communities by way of high-speed Internet connections and Webcams. — Matthew Robb, MSW, LCSW-C, is a social worker and a freelance writer residing in suburban Washington, DC. Reyes agrees: “Social workers need to be mindful that returning soldiers are not going to tell them they are binge drinking. It usually surfaces behaviorally, such as in motorcycle accidents, suicidal gestures, going AWOL.” In addition, female servicepersons may present with issues related to military sexual trauma.